"I wonder if I've lost my nerve?" was Bill's question to me as he signaled for yet another break to quiet his agitation. It was a matter I too had wrestled with over and over that day and since being in Portugal. We were both terrified by being on the road, as we had been on many other days since crossing the border from Spain. After 5 miles of white-knuckle riding I suggested that we pull into the first reasonable looking lodging and hang it up for the day. Pleasing scenery was abundant in Portugal. We were riding a coastal road on the first spectacular weekend after a very long, hard winter in Portugal. All of the local people we'd chatted with since arriving in the country were fed-up with the wet, cold weather--we hoped that this especially dangerous day was because they had all headed to the beach for a long overdue sunburn. Maybe if we sat it out the next day, Monday, would be safer. But unfortunately, there was no lodging available before we arrived at our destination for the night, though our sense of safety did improve as Bill sought out rougher farm roads after lunch to shield us from the drivers. .
Like wanting to fall in love with Lisbon but not being able to, we were having a hard time falling in love with Portugal, though we wanted to. The landscape was much greener and prettier than most of Spain; there was little litter marring the scenery as is so often the case in southern Europe; the unseasonably cool, wet weather was better than if we were at home; lodging was generally pleasing and a very good value; we felt safe--when not in traffic; and our lives as travelers were simplified by the supermarkets being open on Sundays and during lunch. The historical sites were scant aside from the many churches but the scenery made up for what the museums lacked. The overbearing problem was that though the Portuguese people were lovely, they were terrors when behind the wheel of a car, which echoed Lonely Planet's warning. We both had ruminated on the question "Is it them or us?" in assessing the source of the problem. In my mind, it was clearly "them." Upon leaving Lisbon, we'd seen 2 traffic accidents in 4 days, which rivaled the number we'd seen in 9 years of cyclotouring abroad (which soon became 3 accidents in 10 days). And a few days latter we bumped into another pair of experienced European cyclotourists from Portland, Oregon who had also found themselves calculating and recalculating their odds of getting killed while on the road in Portugal. Maybe the drivers expected divine intervention. The lack of defensive driving--OK, the lack of any thinking at all when behind the wheel--was epitomized the day a truck ran Bill off of the road. Bill was snuggling up to the bushes and the truck driver still didn't have enough room to get by the oncoming car which had also come to a complete stop. Few drivers so poorly anticipate a situation on a straight road that everyone has to halt and it still doesn't work out--and in this case it was 2 of 2 drivers not planning ahead. Over and over again we witnessed what we interpreted as absolutely clueless driving behavior, a "press on regardless" mentally even when the excessive speeds made the stakes high. We struggled to generate a story that explained the "see nothing; never brake; don't move over" driving culture and no story we imagined accounted for the high percentage of really bad drivers. Candidate theories to explain the phenomena included: wine being as little as $1 a bottle; a sudden improvement in roads leading to a sudden increase in driving speeds; and minimal driver education, but they were only guesses. Regardless of the cause, we no longer wondered why Portugal has one of the highest traffic accident rates in western Europe. Even more discouraging was experiencing the same "too close for comfort" driving style of the police force when there was no oncoming traffic. Even as pedestrians we were astounded as to how "unseeing" or just plain obnoxious the drivers could be. 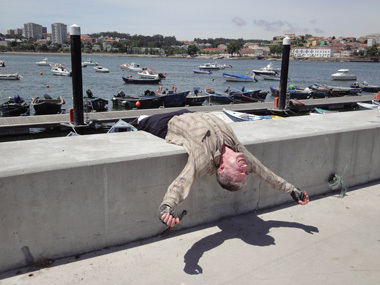 We were walking on a Lisbon sidewalk when a man turned his car into me. Inches from me, I backed up. Amazingly, he kept cranking his wheel and advancing towards me. As I retreated, he kept aiming for me. Oh to have had a 2 by 4 piece of lumber in my hand to have thrashed the hood of his car! Over and over again we asked "What is he/she thinking?" and the only answer was "Not!" Better to admire the street decorations than be in the traffic. During our many time-outs on the road to collect ourselves, we revisited why we were doing what we were doing. In the deep reaches of our memories we finally recalled that we cyclotoured because it was fun, because we liked it. But there was nothing fun about being on a bike, or on foot, in Portugal. On an average riding day in many other countries I'd study the Italian words strapped to my aerobars; look at my gauges for speed, distance, elevation gain, and road steepness multiple times; and effortlessly sit up to drink from my water bottle or blot my eyes with a tissue. On the best of days, we'd spend hours riding side by side chatting about what we were experiencing or practice Italian. But not so in Portugal. Rarely was I doing anything other than calculating where I needed to be on the pavement when just a single car was in sight to avoid being hit, even if it was an oncoming car. A lapse in concentration for a moment could be fatal in Portugal. Road design decisions compounded our problems created by the often reckless Portuguese drivers. I was stunned as to how often new 2 and 4 lane roads had shoulders that extended no more than a couple of inches beyond the far line or might be bordered by a concrete curb. Often the lanes on shoulderless roads were too narrow for a bike and a car to share the lane. Even new roads that linked with short stretches of new bike paths lacked any space for a bike once the path abruptly stopped. Though it was illegal, we wondered if we'd have been safer on the freeways. When nasty traffic conditions took the fun out of riding last year in Montenegro, I had suggested we bail on the Balkan Peninsula and instead give Portugal a try for our spring riding in the south of Europe. But Portugal was quickly looking like another loser for cyclists and this time my remedy for our distress was suggesting Machu Picchu for the following spring. Our 10 years of overseas cyclotouring had seen us pushing past the edges of good cycling conditions in Europe as we looked for adventures in new lands so perhaps it was time to satisfy the need for discovery by changing continents, by changing activities. Machu Picchu had long been on Bill's "must see" list but hiking there had been postponed by our overseas cycling. But we'd been sensing it was time to change our rhythms a bit and we quickly generated a tentative plan: we'd have a shorter stay at home this winter; spend 3 to 4 months hiking around Machu Picchu and in the Argentine lake district; have a second short visit home in the late spring; and then travel 5 to 6 months in cyclotouring-friendly central Europe during the summer and fall. We would still get the pleasure of having our fitness for the year peak in the Alps, both in riding the high passes and in hiking in the Dolomites, and yet we wouldn't be cycling in the more dangerous 'fringe' countries. Time will tell if we'll make it to Machu Picchu early in 2011, but at least it was now on the drawing board; at least we had a plan to retain our traveling life, our fitness goals, and our need for adventure without excessive risk. If not Machu Picchu, then no doubt some other destination or strategy will emerge to restore the balance in our days that was lost when cycling in places like Montenegro and Portugal. We only saw women on their knees at Fátima. 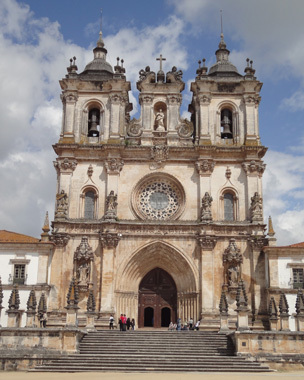 The city of Fátima wasn't on our radar until the Pope came to Portugal: he and we arrived in Lisbon about the same time and he and we were headed north. Fátima was the focal point for his visit so we thought it best to see what the buzz was about. Like Lourdes, France that we stumbled upon in 2008, Fátima is an important pilgrimage site for Catholics who pilgrimage. Like Lourdes, Fátima was the site of a series of visions and miracles involving the Virgin Mary, but by 3 children over a period of 6 months in 1917 instead of 1 girl in 1 month in the 1800's. Like Lourdes, Fátima has massive grounds to accommodate mobs of people; a wax museum retelling the story of the visions; a 'petite train' to haul tourist-pilgrims around on the city streets to various sites; and dozens if not hundreds of little shops selling everything from $15 glow-in-the-dark Virgin Mary statues to $10,000 religious art items. Unlike Lourdes, Fátima had a very upbeat feeling about it. As soon as the main street directed our bikes towards the sanctuary area, the bubbly energy of the crowds was palpable. 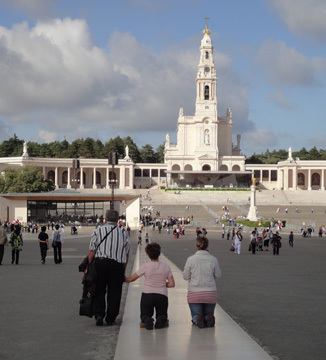 On the day that we arrived, Fátima was like a summer camp for senior citizens. Many had come as members of tour groups and wore matching embroidered white baseball caps or green kerchiefs around their necks. They excitedly chattered as they slowly strolled along the promenade towards the basilicas. A half dozen independent traveler women shuffled on their knees on a prescribed route in hopes of receiving a miracle or intervention but the masses were seemingly in a more of a sight-seeing, religious-tourism frame of mind. Slender candles headed for the pyre. In contrast to the cheery feeling of Fátima, Lourdes, France was the destination for desperately ill people. At Lourdes, wheelchair convoys plied the grounds on a set schedule to help improve the odds of the infirmed receiving divine intervention. In Lourdes we were preoccupied with understanding the rituals the ill were participating in whereas in Fátima we were in 'tourist mode' like so many others. We spent about 3 hours taking it all in: the wax museum did a fair job of filling in the details of the visions; we peeked at the tombs of 2 of the 3 beatified seers that generated long queues; we retraced our steps to admire the Holm oak above which the Virgin Mary appeared, an oak that looked like it was receiving excellent care; and toured the old and new basilicas. I was most surprised by the candle burning ritual at Fátima. I'm not a believer but I am drawn to the tradition of lighting a candle in honor of someone and have done that more than once. At Lourdes the candle burning area was turned into a well-organized inferno strip and people bought candles the size of small trees to light and burn at the site. 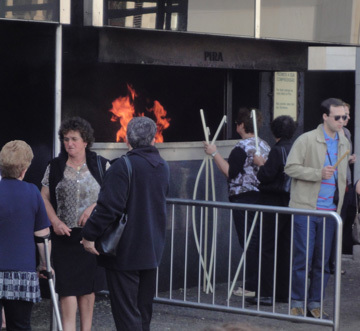 But the folks managing Fátima's candles were surprisingly pragmatic about the entire ritual. In my mind they'd structured the process to the point of extracting the heart from it. A literal gatekeeper limited the lighting of candles to 2 per person at Fátima and there was only a small area for placing a lit candle to burn down to the nubbins. Either for efficiency or safety they instead had a pyre in a metal box into which people heaved armloads of candles. The bundles of candles were tossed like pitching garbage over a wall, which looked devoid of devotion to me. In addition to standard sized candles, long, slender ones were bent so they too could be pitched under the hood of the pyre. For sale: souvenirs & votive offerings of wax body parts. 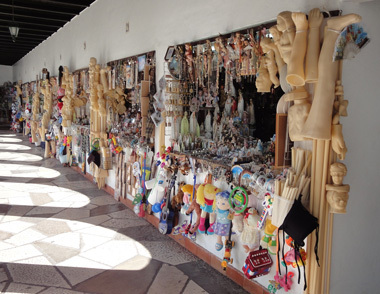 The souvenir shops sold wax replicas of body parts to be tossed onto the pyre as votive offerings but it appeared that individuals weren't allowed to do that themselves either. Instead we saw a tent with wax statues lining the back and pans of wax body parts poised in front. Presumably the faithful deposited their wax votive offerings in the tent for attendants to burn on the pyre in their behalf at a latter time, which wouldn't have been at all rewarding to me. Our traveling life satisfies a number of needs in us and increasing our understanding of ourselves, of others, and of the world at large are among the objectives served. Seeing pilgrimage sites that have become highly organized tourist operations isn't something I ever imagined would inform our travels. But when Bill was on the fence as to whether we should go to Fátima or not, it was clear to me: I wanted to go. Lourdes was an exceptional, memorable experience and I wanted to see another spin on a similar phenomena. Being there, seeing it, feeling it speaks volumes to me about the range in the beliefs, needs, and modes of people. It's good to be reminded that one cannot presume that others think the same way as oneself. 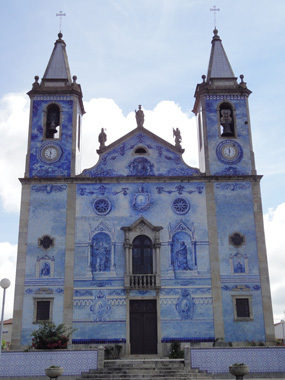 Our experience of central Portugal was hugely different than that of the Algarve region of southern Portugal. Some geographers and meteorologists view the Algarve as part of North Africa instead of the Iberian Peninsula and we too felt like we were visiting 2 different countries within 1 for more reasons than just the weather. Churches were the main sightseeing attraction. During our first days in southeastern Portugal we felt a sharp class difference between the locals and the tourists, that uncomfortable "have/have not" divide. We were also startled by the "life is hard" look on too many faces. And we were stymied by our first contacts with the hospitality industry as the people we encountered could not help us by using either English or Spanish. But after weeks in central Portugal, those early experiences in the Algarve were distance memories. As we traveled further into the country, even the folks at the desk of family run, budget lodging establishments could muster some carefully spoken English words to ease transactions. And the sense of Portugal being a poor country completely vanished. As Bill wound us through tiny villages on back roads and into cities we couldn't fathom that Portugal was one of the poorest countries in western Europe and there was no obvious reason why it should be. The tilled soil often looked beautifully rich, water seemed to be abundant, and the standard of living looked comfortable. The agricultural endeavors were quite varied and included cereal crops, potatoes, rice, corn, onions, cabbage, tomatoes, grapes, and olives. The prices in the markets suggested that pineapples and kiwis were also grown locally. Eucalyptus, pine, and cork oak forests added to the sense of wealth from the land and the country's long sea coast and many ports gave it the advantages of sea trade and fishing. 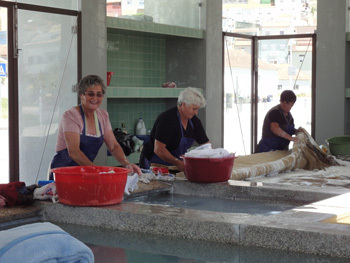 The Portuguese people consistently presented themselves as industrious, conscientious people. There was almost no littering and people's casualness about leaving things like their just-purchased groceries unattended suggested that petty theft was at a low level. 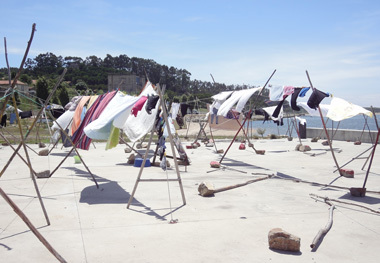 And even though the climate, the crops, and the style of homes reminded us of the Mediterranean, we did not sense that the Portuguese approached life with the sense of powerlessness that seems rampant in parts of the Mediterranean. 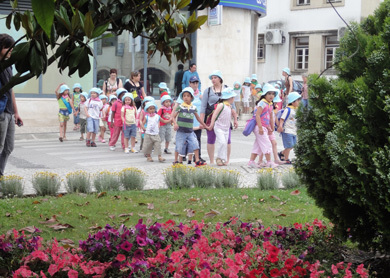 Kindergarten is free for 3 - 6 year-olds. 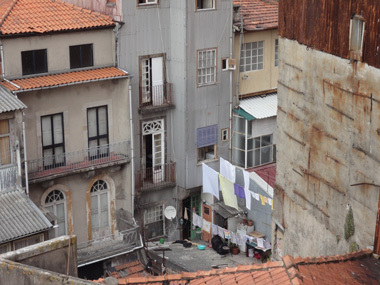 A bit of reading about Portugal told a story that wasn't obvious from the road. Substandard housing had haunted the country and much of the new housing stock was only a decade old. The literacy rate was now in the acceptable range but the "functional literacy" (a new term to me) was quite low. According to a 2007 survey, 64% of Portuguese had never read a single book. Museums in Portugal did seem to put a happy spin on the country's history but 40+ years of repressive dictatorship only ended in 1974, so democracy was quite new to Portugal, as it is to Spain. I don't read many books in a year myself but the incongruities between the look of Portugal and the realities have had me looking for a book to fill-in the many missing stories. Being in Portugal when the economic woes of the "PIIGS" (Portugal, Ireland, Italy, Greece, and Spain) were making headlines was especially interesting. Greece's rampant corruption, lack of cultural cohesion, and lack of a strong central government were the final blows to its debt crisis. Though lumped into the same financially-vulnerable category as Greece, even as tourists we could see major differences between Greece and Portugal and their prospects for recovery. Tax evasion on all levels is a major problem for Greece and is viewed by some as a national pastime but it was clear to us that at least at the level of sales tax collection, Portugal was radically different from Greece. I always viewed sales receipts as proof of payment to benefit the customer but I quickly came to understand during the PIIGS crisis that receipts were also a means of fighting the war on tax evasion through accountability. Substandard housing is still an issue. In Portugal we were given a receipt for absolutely every purchase, no matter how small and there was a VAT or 'value added tax' on everything. Most countries in Europe exclude unprocessed and basic food items from taxes but not Portugal. I was stunned to see that even bread carried a 5% tax and my 50¢ bread purchase generated a receipt. Instead of leaving receipts for small purchases behind at the store, I carefully took each one with me as a symbolic gesture to honor the commitment to containing corruption. As in struggling to understand Portugal's history of impoverishment, we struggled to understand why the country was in financial crisis. The flow of development money into the country since joining the EU showed in the many new train stations, kindergartens, and playgrounds. Tourism development money was also evident in new directional signs to tourist points of interest, in the many refurbished museums we saw, and the occasional bike lanes and pedestrian promenades. It seemed that the money was well spent, so what was the problem? For weeks we wrestled with the issue of "What's not working right in Portugal?" when the TV headlines told a story that conflicted with what we saw from the road. 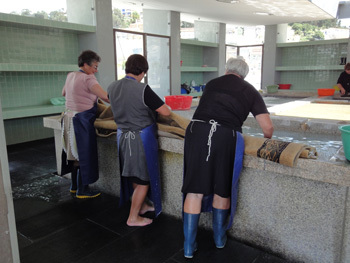 It was a rare, leisurely ride into Porto that delivered the iconic image for the possible problem: it was the sight of 8 women outfitted like fish mongers in tall rubber boots and long heavy rubber aprons doing laundry with scrub brushes and bar soap at a public trough that had Bill proclaiming "This is it; this is the problem." Developed nations do not sustain their growth and prosperity by unskilled hand work; they propel themselves by endlessly increasing productivity through mechanization at all levels. Though hand washing everything from children's socks to bath towels and rugs was a trivial issue in itself, resignation to low productivity activities on a national level could be one of the underlying problems. Maybe they were too well adapted to making-do instead of pushing to make the leap forward. The smiling woman on the far left was singing, off key, at the top of her lungs & loving it. Spell-bound by the sight of these women, we thought back to all the small-scale agriculture production we'd seen. Indeed, much of the land we saw worked was done by hand. Some fields were clearly too large for the family's own needs so at least part of the 'commercial' agriculture was the product of handwork--a link with the land that countries can ill-afford these days. (I believe that through most of its history Portugal has been a net importer of food, so living so close to the land may have always made poor economic sense.) Time will tell if we were right, if it is the too-slow movement towards increasing productivity that is one of Portugal's fundamental financial issues. The Portuguese may be too slow in embracing mechanization but they are way-too willing to embrace speed on the roads. The driving courtesy did mysteriously improve as we traveled farther north in Portugal but there still wasn't enough of a difference between southern and central Portuguese drivers to substantially increase our sense of safety on the road. from his gripping shoulder muscles. As Bill had hoped, the number of roads to choose from did increase as we traveled farther north, but not enough to make riding fun again. As his maps suggested, there were more roads available to us 'up north' than in the south, but roads that to his experienced eye should have delivered lazy riding days were still terrifying. The most unlikely, windy, hilly, poorly paved roads turned out to be truck routes. We were pushing our bikes up 20+% grades on hilly back roads to avoid speeding traffic and still didn't find the peace we longed for. Our approach into Porto and parts of a couple of other days did deliver some pleasant miles of riding but for the most part I'd describe our cycling days in Portugal as "white-knuckled, 2-lunch, bubble-knockers." The "white knuckle" label is for the terrifying driving style of the motorists that left no margin of error and scared the bejesus out of us hour after hour, day after day. The "2-lunch" label is for the hundreds of feet of unexpected elevation gain we accumulated, gain that would frequently have exceeded 7,000' if we were in the 60 miles/day crowd. Even riding 25 miles in a day could generate the need for the calories provided by a second lunch to keep the pedals going 'round. And the "bubble knocker" label is code for the steepness of the roads. We stayed off the highways as much as possible as the ones we did ride had terrible or non-existent shoulders and convoys of trucks. That left us with the side roads, which mercilessly took us up and down the steep hills. My inclinometer uses a bubble like that of a carpenter's level to reveal road grade but it only registers to 20%. Too many days the bubble was knocking against the end of the scale, hence a "bubble-knocker" road is one of greater than 20% grade, of which there were many. The day we crossed the border into Spain we had the definitive answer to our questions about "them or us" and "losing our nerve." Within seconds of crossing the border into Spain we felt the difference: suddenly the drivers were patient; suddenly the drivers swerved around us instead of sticking to their previously chosen trajectory; suddenly the drivers were capable of braking in difficult traffic; suddenly riding was fun again. Now it was time for us to fly like the wind. Lingering in Lisbon an extra 10 days in May to tend to family matters back home left us short of time to make our June 25th apartment reservation in the Dolomites of Italy traveling by bike, so 2 weeks before our arrival date we began hitching a lift on the regional trains. Our slow biking traverse of Portugal was cut short by about 80 miles as we made up for some lost time by taking the train in the north. We'd hoped to visit the Pico's Mountains of northwestern Spain this year as they were snowed in when we were in the area in 2004 but the Pico's would remain on the "Next Time" list for yet another year. Bill sped us across northern Spain in 5 days on the single train route that allowed bikes. The plus-side of taking the train was seeing a part of Spain we'd never experience from the saddle because of the scant lodging between the cities. 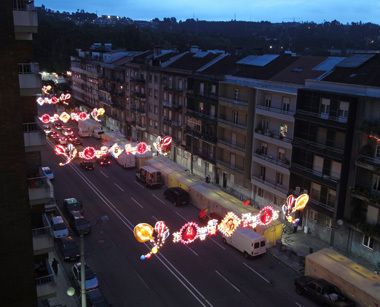 But as we stopped for the night or changed trains at Vigo, Léon, Palencia, and Vitoria I longed to linger in Spain. I love Spanish cities. They are so grand, so calm. They have a pleasing mix of monumental, decorative architecture and green parks with long walking paths that tug at me. But now we were on schedule and had to keep moving. Parts of France, Germany, and Austria would also whiz by as Bill mixed train and bike travel to maintain as much fitness as possible as we made our way into the eastern Alps. Every few days we would be retrieving lost vocabulary in a previously familiar language and we'd see our transportation expenses go from the price of a few spare parts in a year to hundreds of dollars. The journey reminded us of why it had taken us 10 years to get to Portugal: it's a long way off the beaten track. We crossed our fingers and hoped that the wild cards we'd budgeted some time for would not appear: yet another round of flight cancellations due to the Icelandic volcano's eruption and labor strikes. The volcano was totally unpredictable but the strikes were not. Austerity plans being implemented by all European countries were hitting the public sectors hard and there already had been an uptick in strikes. Both the volcano and the strikes were "when, not if" issues and both had the potential to halt our eastward train journeys in the reactive snarl of travelers searching for options. We'd have to err on the safe side to make our date in the Dolomites. We made it across northern Spain, mostly by train, without being affected by the threatened general strike against the socialist government's austerity plan. But what we hadn't anticipated was a fierce storm hanging over southern Europe that dumped 14" of rain in less than 24 hours in southern France the day before we crossed the border into the country. The downpours and pulsing winds in our region had us hopping a late train on a day we'd planned to cycle as we try hard to avoid getting caught in flash floods. Train line closures due to the flooding suddenly limited our options in France, but unlike in Spain, at least we had options. Bill continues to plan our dash to the mountains on the fly as each day we get more information about the train routes available to us.